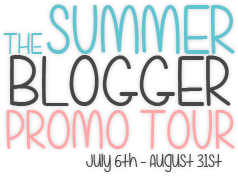 Welcome to the Summer Blogger Promo Tour! Us ladies here at The Book Bratz decided to host a tour to promote some pretty awesome book bloggers, even though book tours are pretty awesome...we just figured that it was time for some bloggers to be recognized for a change. So, the Summer Blogger Promo Tour was born! 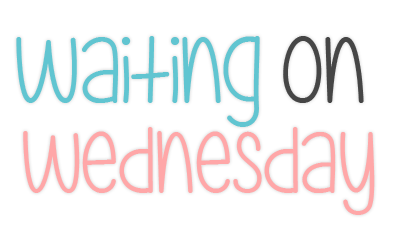 Every Sunday (starting next week) in July and August, we're going to be putting up a post for the tour here at The Book Bratz--and our post will be highlighting a different awesome book blogger and their blog each week. In return, the other book bloggers in the lineup will be doing the same thing on their blog every week! So you guys pretty much get to find out about 8 awesome new blogs to go follow throughout the summer. How cool is that? Pretty awesome. After that, August 31st is going to be a wrap-up post on how awesome the tour was, who we met and what we learned, etc. Get ready, because it's going to be an awesome and interesting summer. See you all next week when we talk about BookCon and more with our first stop, Dana Square! Fast paced, with raw emotional scenes and plenty of action, full of twist and turns. It left me on the edge of my seat until the very last word. The story starts in the the operating room were Sarah is undergoing an experimental surgery (Tabula Rasa) to have her memories erased. She doesn't know why, only that she is lucky to be given a second chance. But things don't go planned and soon the lights are out, soldiers burst in shooting, and there is not escape, especially not with a full force blizzard outside. When Sarah barley escapes from the hospital with her life she runs into Thomas, who she begs into helping her escape the soldiers that were sent to kill her. Soon Thomas and Sarah are in a fight for their lives. I didn't release how fast this book was until the end. The whole story only takes place only a handful of days, and the setting is one place. The hospital. I liked Sarah too. She was strong willed and sarcastic, two of my favorite things in a character. It was also refreshing to learn her memories that were taken during surgeries along with her. You never knew what was coming next. I haven't been content with an ending to a book/series in a long time. But I can say that I was more then happy with the ending. Yes, it may not have been ideal but it is better then nothing right? Recently, we were nominated for the Liebster Award by Emily @ Tea & Fangirling. 2. Answer the questions that the tagger set for you, plus create 11 questions for the people you tagged to answer. 1. I sleep way too much. 2. My favorite food place is Taco Bell. 3. I am a junior in high school. 4. I have 3 siblings: 2 brothers and 1 sister. 5. I'd rather read than go out and socialize. 6. Starbucks is my biggest weakness. 7. I speak horrible Italian. 8. I am from Long Island, New York. 9. I want to go to medical school. 10. My youngest brother will be in 3rd grade when I graduate high school. 11. Did I mention I like Taco Bell? 1. I love reading and writing. 2. I actually published my first book not too long ago, which you can buy by clicking here! 3. I've been dancing for 14 years. 4. I want to go to Columbia University to get a Creative Writing degree. 5. Nutella is love, Nutella is life. 6. My favorite book is Looking for Alaska by John Green. 7. I forced my boyfriend to read TFiOS to see if he would cry (he claims he didn't, but I believe otherwise). 8. I have one brother and one sister, both younger than me. 9. I'm currently applying to work at Barnes & Noble. 10. I'm currently writing my second book. 11. This is going to be my second year as a NaNoWriMo Participant! 1. What is your favorite genre of books? 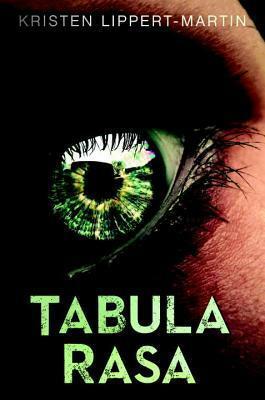 Amber: Fantasy, Science Fiction, Horror and sometimes Mystery. It depends on the book, though! Jessica: I'm all for YA, specifically contemporary! Amber: I have a Yellow Lab named Bud and a black Beta fish named Smokey. Jessica: I have several--a naughty little beagle named Lola Belle, a beta fish named Mugsy Mallone, a goldfish named Cam, and a sugar glider named Zoey! 3. What is your favorite stand-alone book of all time? Amber: I have to pick one? I guess The Fault in Our Stars by John Green. Jessica: Looking for Alaska by John Green, for sure. 4. What is your favorite final book in a series you've read? Amber: Again, I have to pick one? This is really hard. But I have to say the conclusion to Rachel Vincent's Soul Screamers series. Jessica: I'm not a huge fan of series books, but the conclusion to the Gossip Girl series was pretty good. 5. Least favorite book character? Amber: Adam from Shatter Me by Tahereh Mafi. I liked him at first but then by the end of the trilogy I hated him. Jessica: I'm going to have to say Adrian from Vampire Academy and from Bloodlines. I just can't make myself like him..I don't know. 6. Favorite childhood book series? Amber: Haha, I didn't like reading as a child. You couldn't even get me to read Dr. Seuss. Jessica: I was a big fan of Nancy Drew and Trixie Belden. 8. What is one book that you can read again and again and never get tired of? Jessica: It's definitely a tie between The Fault in Our Stars and Looking for Alaska, both by John Green. 9. A book character you wish was real? Amber: Daemon Black from Jennifer L. Armentrout's Lux series or Augustus Waters from The Fault in Our Stars by John Green. Jessica: Augustus Waters! That boy is a godsend. 10. Favorite author you follow on Twitter? Jessica: "Love is just a shout into the void, and oblivion is inevitable." 1. If you had to choose, who would be your book boyfriend? 2. If you could redesign one book cover, which book would it be? 3. 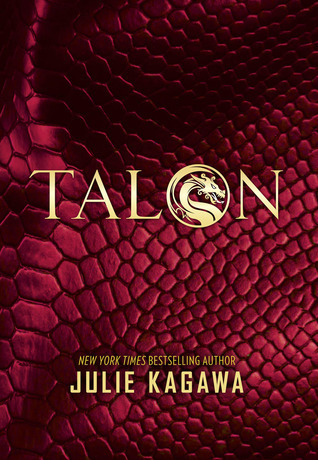 What's one book character that you wish had their own series? 4. What was the worst book you've ever read? 5. Why was the book you mentioned in Question #4 the worst book you've ever read? 6. If you could recommend one book to the whole world, what would it be? 8. What was the last book you read (completely finished)? 10. What's one genre that you just can't get into? 11. What's your favorite thing about being a book blogger? Thanks again for our nomination, Emily! ".... a gruesome thriller suggested by the events of the Amityville Horror." 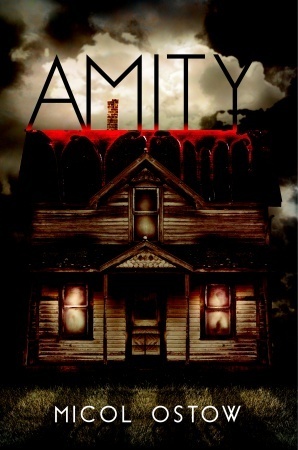 I saw the name Amity and the first thing that popped into my head was The Amityville Horror. I live on Long Island. Less then twenty minutes away from the actually Amityville Horror house, so of course anything involving it will catch my attention. I was disappointed that this wasn't a retelling. But besides that I enjoyed the story. This was another book were I abandoned all my responsibilities and laid on the couch all night to read. It is told in alternate times. Ten years ago and today. Conner had lived in the house ten years ago. Now, when I first started the book I liked Connor, I really did. Then the book progressed and I found that some things he did were not normal. My biggest question is, was he in love with his sister? There is a part in the book that suggests that, then a dream were she kisses him. Qwen currently lives in the house. This was her parents latest escape with their family after Qwen's latest mental break down and she is convinced not to screw it up. Then she starts having the dreams, starts referring to Amity as if she were a person and seeing things, just like Connor had. As much as I liked the book there were things I didn't like. There were many things that were unclear or unanswered. Especially Connor's letter at the end. What exactly did he mean by everything he said? Who was the decomposed girl that Qwen kept seeing? Was it Jules or someone else from Amity's past? I won't lie. Going into this book I was nervous. I don't read contemporary fiction much. Actually I never do. I usual need a book with a fantasy or sci-fi aspect to keep my interest. 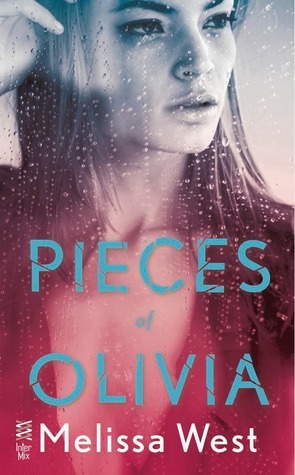 But Pieces of Olivia was different. I was hooked with in the first few chapters, and by hooked I mean: I abandoned all my responsibilities to read. Olivia, how my heart broke for her when she would talk about the night of the party, the one where she ended up scared and broken. The end of high school the start of college is suppose to be a good time, not one filled with nightmares and lost. But when she enrolls at Charleston to restart her life she never planned on meeting Preston. Olivia's roommate, Kara's best friend. Preston isn't the type of person so have a long lasting relationship. He has flings that last for a bit and then end. Kara gets stuck being the between girl, stuck listening to these girls complain about Preston and she hates it. When Olivia asks why Preston doesn't do the relationship thing she receives the reply from Kara that is isn't her story to tell. When she asks Preston, he tells her the same thing: It isn't his story. So that leaves you wondering. Who story is it then? All through out the book there was always this strange tension between Kara and Preston that I was dying to know, and then bam! You find out and your heart splits open and you look for your box of tissues. I could only imagine what ran through Olivia's head. "I can't breathe when you're around. I can't think. I can't control my mind and forget my body. I am useless and weak and I hate this version of myself. Yet... I have never wanted anyone like I want you." The book takes place over a couple of months, from the start of their first semester and into part of their second semester. So the romance wasn't fast, it was set overtime and I loved that. I don't like books where the Main Characters rush into a relationship head first and saying "I love you." It is just not real like that. Plus, Olivia wanted him and slowly fell for him through out the book. I really adored Preston and Olivia's relationship. He never pushed her to tell about her past, and when you have a dark past you don't want someone pushing for you to tell it. That is just how it is. But Olivia wasn't the only one in the book with a story, and Preston's reasoning for not dating long term bought tears to my eyes. Now Rose, I loved her. Her and Olivia's relationship wasn't one of a patient and a doctor, it was like two friends. At first when Rose was talking about ghost I thought the woman was crazy, but then as Melissa introduced her tp you began to see that she was a good thing for Olivia to have. 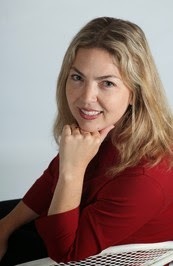 Now, I must wait until December of Miles of Kara by Melissa West, which as the title says is about Kara. *sighs* Melissa West also said that the cover for the second book will be even better then the first. *even bigger sigh* But I still have to wait! As the GIF above says, I have all these feels that I didn't have when I started reading. Including millions of unanswered questions, and an almost eight month wait to get the answers. Oh boy. 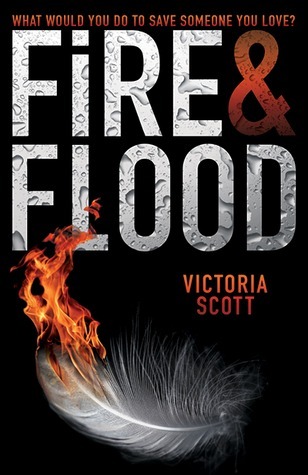 Did Fire & Flood remind me of The Hunger Games? Yes. There were some things I found similar, but a majority of it wasn't even remotely the same. Which made me happy because I wanted to love this book and guess what!? I do! (I have read enough reviews to see that people are torn) There are similar themes and settings, but every book has to start somewhere and this is totally different. I have two brothers, one seven and another fifteen. I would easily give my life for either of them. (No matter how much I say I hate them.) I can see Tella's determination to get through The Brimstone Bleed successfully. Though she questions herself throughout, or makes stupid decisions. But she is sixteen, sixteen year olds can make stupid decisions. The Pandora's reminded me of Pokemon. Only these were animals with genetically altered abilities. Some that were really cute, then some that are really scary. Madox, if he was real I would probably kidnap that poor thing because he was so cute. I worried about him more then the main characters sometimes. As usual I fell in love with the boy who the main character is lusting after. This time his name is Guy, we are totally going to get married. You know if he was real and all. Guy was very mysterious and I feel we learned the most about him in the last 1/4 of the book. I don't have much to say about this book. Have you ever loved something so much you have no words for it? Well that is me right now. but it comes with a fatal sting . . .
goddess who created the first ancestor bee-charmer and cursed her bloodline. that hope, spinning Melaina into a swarm of love, friendship and death. Just in case he tangles again with my sisters. I nod like a bobblehead doll and wonder if it’s the aftereffects of the trance, or whatever it was I just awoke from, or if it’s Sam’s presence that’s causing the room to shrink. “Change your clothes and meet me outside,” he says, and heads for the door. My jaw falls. Gran was righter than royal jelly. Every cell in my body is screaming to touch him, and now he’s insisting we go out. Double crap. But I need to go; I owe him that much. I will just have to maintain control. I hurry upstairs and swirl a toothbrush in my mouth, throw on some jeans and a fresh tee, and grab a hoodie. I scribble a note to Gran before I head out the door, fully aware I’ll be facing her crinkled forehead later. The passenger side of Sam’s white pickup is open, inviting me inside. He’s behind the wheel, head cocked to watch me as I walk toward him. We’ll walk by the river, maybe fish. Then I’ll tell him once and for all we can’t ever be more than friends, and that he’ll thank me in a few months when August brings his eighteenth birthday and his ticket to boot camp somewhere far from here. He won’t want to think about leaving, but for once, I agree with his dad. Sending Sam away is the best thing for him. It’s the best way to keep him alive. 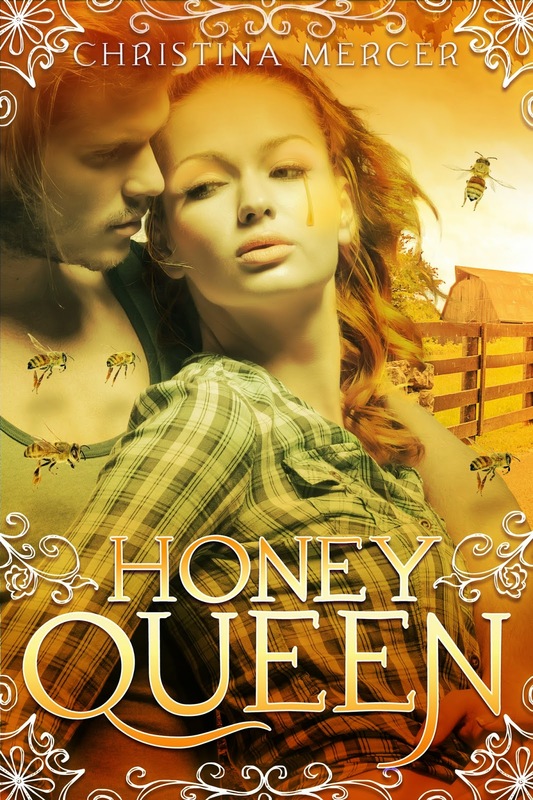 life with her husband, two sons, four dogs, and about 100,000 honeybees. buzz card, beeswax lip balm, honey sticks, honeybee charm.